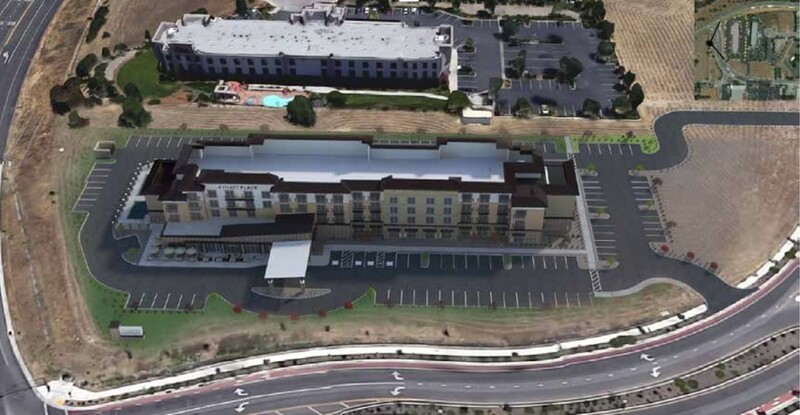 Rendering Courtesy Of The City Of Paso Robles HOTEL SPAT The La Bellasera Hotel owner is suing Paso Robles over a land swap with another hotelier that will allow for the development of a Hyatt Place Hotel, rendered here, on the adjacent property. The owner of the La Bellasera Hotel and Hampton Inn and Suites in Paso Robles has sued the city, calling a recent land swap deal struck by Paso and an incoming hotelier "a backroom deal" for the "private benefit" of the company. The swap, executed by the Paso Robles City Council last September and modified on June 5, gave Bay Area-based firm Zenique Hotels most of a vacant city parcel on Theater Drive (next door to La Bellasera) in exchange for a Zenique-owned property with the River Lodge Motel (also next to La Bellasera). Zenique submitted plans in 2016 to build a four-story hotel in the place of the River Lodge Motel, but local groups like the Paso Robles Historic Society and Paso Robles Main Street Association spoke out against demolishing the 1950s-era motel. "[Community members] emphasized the importance of maintaining the existing historic motel building and motel sign, as contributors to the unique historic character of the community," a Paso city staff report for a June 5 council meeting read. The City Council scrapped that project, but subsequent negotiations led to the land swap—and a June 5 city approval of a four-story Hyatt Place Hotel on Zenique's newly acquired, formerly city property. "One of the conditions to the property exchange is city approval of a hotel project ... to be conveyed to Zen," the city staff report stated. "Once the property exchange has been completed, the city will move forward to a community input process on the best reuse options for the River Lodge Motel." Kevin Bierl, owner of La Bellasera Hotel and Hampton Inn, opposed the property exchange and hotel project since they were proposed, according to his lawsuit filed in SLO County Superior Court on July 6. The suit states that he was denied a previously promised opportunity to purchase the city's parcel himself. Bierl is asking a judge to nix the land swap and Zenique project, alleging that the negotiations weren't done transparently, that Paso failed to analyze the environmental impacts, and that the exchange benefited Zenique more than the city. After it approved the land swap in September, the City Council asked for property appraisals on both parcels, which found them to be of close-to-equal value. But in the lawsuit, Bierl argues the appraisals were inaccurate because they assumed both parcels would be developed into hotels. "In the end, the city would approve a lopsided deal to give away to Zen its vacant and fully developable Theater Drive parcel in exchange for Zen's presumably undevelopable River Lodge [Motel] parcel," the lawsuit states. In response to the allegations, Paso City Attorney Iris Yang told New Times that the lawsuit was filed too late, after a six-month window to challenge the September property exchange. "There's a basic misunderstanding of the facts," Yang said. "We'll file an appropriate response." Yang also noted that the city modified the exchange agreement on June 5, which allowed the city to retain about a half-acre of its property. She also said the property appraisals were requested by the City Council after it had entered the exchange agreement. "The execution of the agreement wasn't contingent on getting an appraisal," she said.